Anaren fits the bill in all these criteria plus it has an Enterprise Value/EBITDA ratio that is less than 7, further confirming the company's status as a reasonable value stock. Indeed, the PEG is less than 1 and Price-to-Sales is only 1.26. 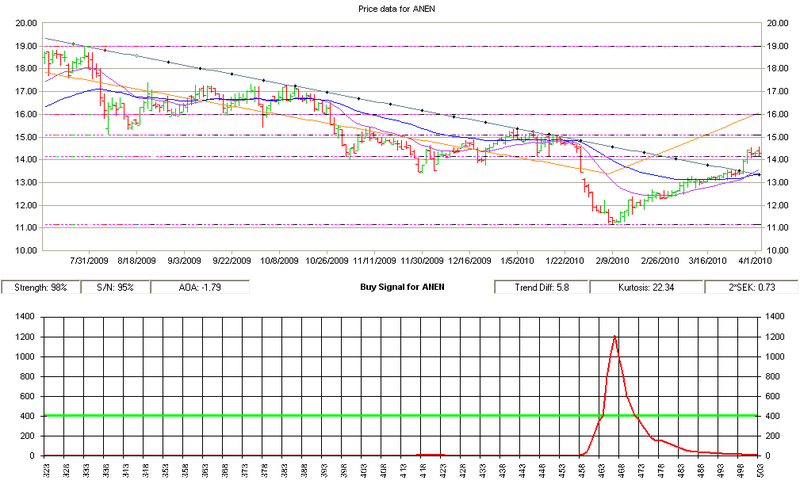 So with the company's value characteristics established, we can look at the technical analysis situation. The chart below is a screen shot from the Trade-Radar software. The top chart shows the stock breaking out above its downward sloping trendline. 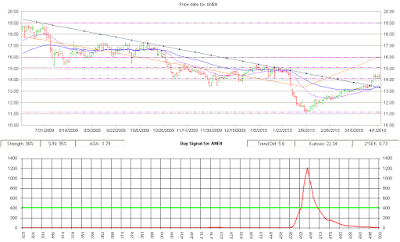 It also shows the how the stock has turned up based on regression analysis and has moved up sufficiently to to register a Signal Strength of of 98%. Furthermore, we see the stock above its 20-DMA and its 50-DMA and a bullish crossover of the 20-DMA over the 50-DMA. The bottom chart show a well-defined BUY signal that kicked in earlier in March. Anaren is in the business of developing microwave and RF assemblies and components used in radar and wireless communications systems. Products include surface mount components, ferrite isolators, couplers, splitters and combiners, attenuators, RF backplane and hybrid assemblies. In addition, Anaren designs and manufactures advanced microwave-based hardware for use in radar systems, jamming systems, smart munitions, electronic surveillance systems, and satellite and ground based communication systems. 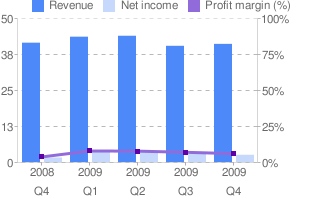 You can see revenue beginning to recover on a sequential basis. Earnings, however, are up 59% year-over-year. For the third quarter of fiscal 2010, we anticipate an increase in sales for both the Wireless Group and the Space & Defense Group from our just completed second quarter. As a result, we expect net sales to be in the range of $41 to $45 million. We expect GAAP net earnings per diluted share to be in the range of $0.18 - $0.22, using an anticipated tax rate of approximately 32.0% and inclusive of approximately $0.05 - $0.06 per share related to expected equity based compensation expense and acquisition related amortization of acquired intangibles. Non-GAAP net earnings per diluted share are expected to be in the range of $0.23 - $0.27 for the third quarter. In other words, the low end of expected results will be about even with the most recent quarter and the high end of expected results will reflect a decent improvement. The company has shown strong growth in consumer wireless applications (56% sales increase in the most recent quarter) which demonstrates that they are not tied only to military or wireless infrastructure customers. What is unusual is that this company is on the Trend Leaders list, it passes the reasonable value screen and it is a tech stock.We don't usually see all three of these combined in one stock. So take a closer look at Anaren. They may not be involved in creating cutting edge semiconductors but they provide the bread and butter components that are important to manufacturing complete RF and microwave devices including cell phones, cellular base stations, radars, Bluetooth devices and wireless routers. Sometimes slow and steady wins the race.